Bacon Genie : Making bacon has never been easier and cleaner. 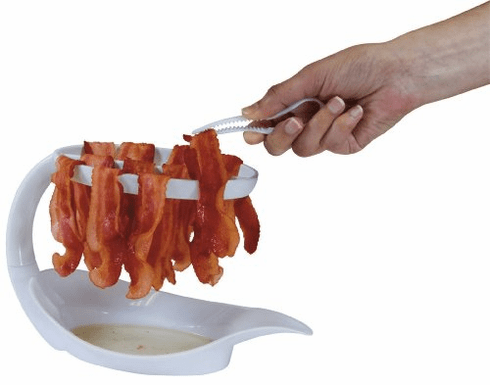 With the Bacon Genie you can make up to 12 strips of bacon in your microwave delicious, crispy bacon. The Bacon Genie eliminates splattered stovetop mess. Since bacon hangs vertically on the Genie, your bacon comes out crispy. Simply hang up to 12 strips of bacon on the Bacon Genie, microwave, remove bacon, place the Bacon Genie in the dishwasher (it's dishwasher safe) and eat. No mess; ready right away.